Fire extinguisher servicing is essential you are to maintain your fire extinguishers in legal condition and ready for use in an emergency. Employers - it is your responsibility to maintain your fire extinguishers and get them inspected and tested, and sometimes even recharged at the appropriate intervals. Our staff are BAFE trained Service Personnel and approved to inspect and maintain all kinds of portable fire extinguishers, including the service and commission of extinguishers bought off the Internet. All parts used are in conformity with Manufacturers' Instructions. If you would like to book a service visit, please contact us. If you are situated in Mid Sussex call ETC Fire for a speedy visit if you think your fire extinguishers need a service, or if you are just not sure, we can advise you on the latest requirements and your responsibilities. ETC Fire's team is ready to inspect, service and refill your fire extinguishers and we can either come as a one-off visit or as part of a regular contract with you to ensure that you never forget to carry out fire extinguisher servicing in the Mid Sussex areas. A yearly service is essential to maintain your equipment in the required order and ensure that it is safe to use. The Government requires all employers to provide safety equipment in case of a fire and train their staff to use it. There's no point in having an inoperable, out of date or empty fire extinguisher, and the fire extinguishers as well as being serviced, have to be stored correctly. As part of our fire extinguisher servicing Mid Sussex our experts will come and assess your fire precautions and advise as necessary if anything is out of place. They will check and deal with your fire extinguisher servicing needs, recharging as necessary and leave a label on your fire extinguisher which must not be removed, with the test date and details on it. The history of the unit is recorded on this label, which is a legal document. 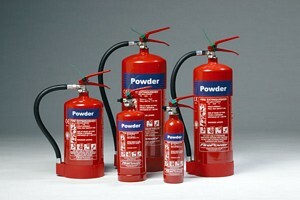 If you need to book a fire extinguisher servicing Mid Sussex, contact us for a free quote, or a visit.